Interview with Guitarist Fulvio Carlini from Sixty Miles Ahead - Welcome To All That Shreds Magazine! “My rig: well, my rig is very very simple. When I play live I use my twins Dean guitar (Cadillac Jekyll&Hide – I customized them, but there’s no J&H signature model in stores) Marshall JCM2000 100 watts and Marshall/Laney 4×12 cabinet. I have a tuner, Mar micro amp and Boss digital delay DD3. I’m one of those who don’t really like to carry more than the necessary on the road. My guitar tech Moreno keeps testing new products for me but every time I try to add something new it doesn’t feel the same. I don’t know if it’s good or bad but right now I don’t need anything else in my rig. I use 0.11/0.54 Ernie ball string on both my guitars. The black one has a drop c tuning, the white one is tuned a half step down. I really like my two twins, they’re probably the best guitars I’ve ever had. I also use tortex triangle 1.14 picks. Check out Sixty Miles Ahead new record from Eclipse Records on October 21, 2016 via streaming services, Amazon, and other online outlets. 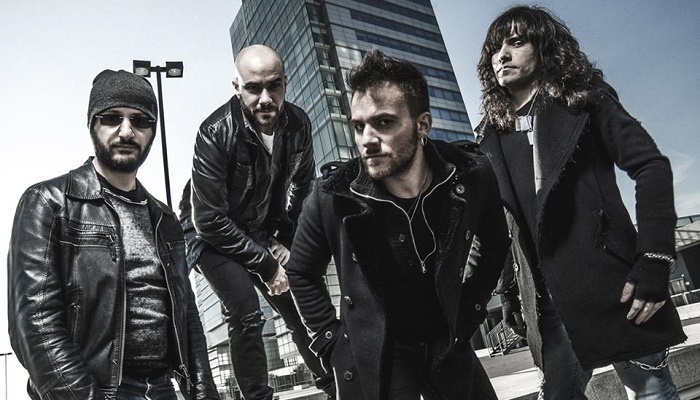 Sixty Miles Ahead are a hard rock band hailing from the suburbs of Milan, Italy. Formed in 2011, the quartet has proven to be one of the most interesting outfits in their country, thanks to their impactful, captivating sound and their ability to hybridize hard rock canons with fresh solutions stemming from melodic heavy metal and a hint of contemporary rock. So far Sixty Miles Ahead have released two studio recordings, harvesting highly favorable reviews from all around the globe. The band’s intense live activity has seen them perform alongside the cream of the Italian hard rock scene, as well as international giants such as Richie Kotzen and Tygers of Pan Tang. After a summer of composing and experimenting, the band released their 2011 debut EP “Blank Slate”, which exemplified how 21st century hard’n’heavy music should be done. Throughout the year, they performed many shows, and build a loyal following locally and internationally. The opening track “Polite Conversations” (also the band’s first video clip) piqued the interest of Italian music channel Rock TV, which invited them to perform a live-in-studio broadcast television performance in Italy. In 2012, the band released their debut full-length album “Millions of Burning Flames” via German label, Antstreet Records. This twelve-song album marked another step forward in terms of songwriting and boldness. The album received much critical acclaim from both old-school hard rock fans and modern metal heads with an open mind. Powerful catchy vocal melodies delivered by vocalist Sandro Casali, are paired with first-class riffing and exquisite solos by axeman Fulvio Carlini, both of which are sustained by the valuable rhythmic work of Luca Caserini. Even the most careless listen to the four singles selected from the record testifies to the extent of the band’s musical spectrum. At some point in 2015 the band parted ways with Antstreet Records, and former bass player David Bosio made way for long-time fan and friend Francesco Li Donni. The band began recording new material, and started searching for a new label to call home. Shortly after the album was finished, Sixty Miles Ahead was signed to Eclipse Records (Mushroomhead, Bobaflex, A Breach of Silence). At this point the four-piece seems unstoppable and the band is ready to meet and shake the global rock scene with their new full-length album entitled “Insanity”. Sixty Miles Ahead are set to show the world (once again), that they mean business… Stand up and get ready to rock, because your ears are in for a treat! ‘Insanity’ is scheduled for release worldwide October 21, 2016. Previous Previous post: Are Bands Exploiting Their Fan Base Through Meet and Greets?